Carlos Beltran is headed to St. Louis after reportedly agreeing to a two-year deal with the Cardinals.After spending the past seven seasons on the East and West Coast, Carlos Beltran is headed back to the Midwest. Beltran agreed to a two-year deal with the world champion St. Louis Cardinals Thursday, according to sources. The six-time All-Star batted .300 and hit 22 home runs with 84 RBI last season with the New York Mets and San Francisco Giants. This will be Beltran's second stint with a team in the state of Missouri. He spent seven seasons with the Kansas City Royals winning Rookie of the Year in 1999. While he’s no longer a borderline MVP-candidate, Beltran’s track record of productivity can be matched by few in the National League since 2005. Beltran ranks sixth in the NL among position players in Wins Above Replacement over that span. Besides his offensive and defensive skills, Beltran has a history of excelling in the postseason. 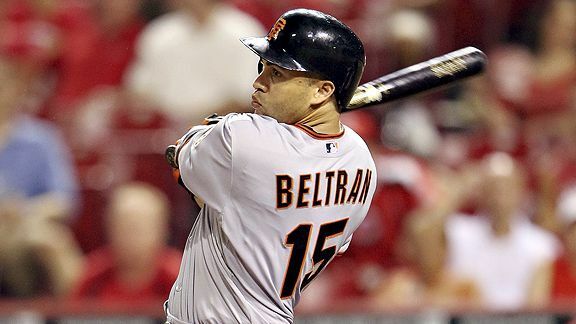 No player in MLB history with a minimum 75 plate appearances has a higher OPS in the postseason than Beltran's 1.302. With Beltran joining the Cardinals, St. Louis now has the two best offensive switch-hitters in the majors from last year. Lance Berkman's OPS was .959 last season while Beltran's was .910. Meanwhile, the Oakland Athletics traded All-Star pitcher Gio Gonzalez to the Washington Nationals for four prospects according to sources. The Nationals receive pitchers Brad Peacock, A.J. Cole, Tom Milone and catcher Derek Norris. Gonzalez had a career best in wins (16), ERA (3.12) and strikeouts (197) last season, but also led the league in walks (91). Few pitchers have provided a greater value for the dollar than Gonzalez. Over the last two seasons, 13 pitchers have won at least 30 games. Of those, Gonzalez has been the most cost-effective option, earning $26,613 for every win since 2010. Gonzalez is under team control through 2015, but he's about to get more expensive. MLBtraderumors.com projects a $4.2 million salary in 2012, the first of Gonzalez's four arbitration-eligible years. With the acquisition of Gonzalez, the Nationals now have three pitchers (Stephen Strasburg, Jordan Zimmermann) who will all be age 26 or younger in 2012. They join two other franchises (Braves, Diamondbacks) who have at least three starters – all of whom were 25 or younger in 2011 - who posted a cumulative ERA better than 4.00 since the start of the 2010 season.